Several government steps over the years have made digital payments affordable. At the peak of demonetisation, banks, prodded by the government, waived off merchant discount rate, or MDR, charges on debit cards to promote digital payments amid unprecedented shortage of cash. MDR is a fee that the merchant has to pay the bank whose customers use credit/debit cards for purchases. It should ideally be paid by merchants but many small retailers often charge it from customers. This discourages people from using cards. The MDR waiver, from November 11, 2016, to December 31, 2016, boosted card transactions. However, banks brought back MDR in January, even though the cash crunch was not over then, a move that, along with the increase in fee for cash transactions, did not go down well with people. The Reserve Bank of India, or RBI, came to the rescue - it reduced the cap on debit card MDR from 75 basis points, or bps, to 25 bps and 50 bps for sub-Rs 1,000 and sub- Rs 2,000 transactions, respectively. For transactions above Rs 2,000, it continued to remain 100 bps. India, a predominantly cash economy with just 11 non-cash payment transactions (by non-banks) per capita per annum, needs to bring down the cost of digital payments to make them popular. In a free market, though it is market dynamics, competition and technological innovations that pull down prices of products and services, here, the government can be a catalyst and expedite the process. 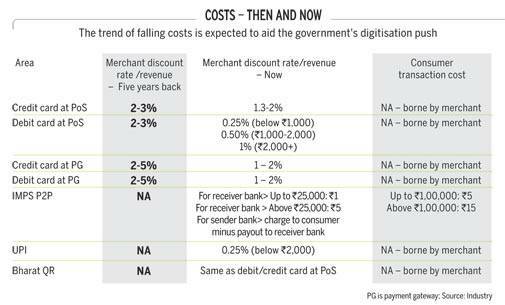 We look at major government initiatives that have shaped pricing of digital payments in India over the years. The setting up of National Payments Corporation of India (NPCI), an umbrella organisation for retail payment systems, in 2008 was perhaps the first major move towards creating a digital payment infrastructure and bring down costs. NPCI started services such as Immediate Payment Service (IMPS), RuPay payment system, Bharat Bill Payment System, Unified Payment Interface (UPI), Aadhaar-Enabled Payment System (AEPS), etc. This means we now have a pan-India digital payment infrastructure that financial institutions can hook on to for offering digital payment solutions at minimal rates. "The government has invested heavily in creating infrastructure for payments, be it through AEPS, UPI, Bharat QR code, NFS or IMPS. A large part of infrastructure costs has been borne by the government or government entities," says Deepak Sharma, chief digital officer, Kotak Mahindra Bank. NFS, or National Financial Switch, is the largest ATM network in the country. It handles an average of 2.5 million transactions a day. There are 37 member banks with about 50,000 ATMs among them. NPCI services have been priced competitively from the start. For example, RuPay debit cards charge banks almost 40 per cent less than international payment gateways such as Visa and MasterCard. "The biggest (government initiative) was Rupay. Before that, a large part of the transaction system was centred around Visa and MasterCard. With Jan Dhan account holders getting RuPay cards and all banks issuing these cards, there is now a large RuPay customer base. And RuPay has been competitive on prices from the start," says Sharma of Kotak Mahindra Bank. Services such as IMPS and UPI have also helped in cost reduction. One can transfer money through IMPS at a cost of zero to Rs 12 (plus service charge) per transaction compared to the Rs 2-25 that one has to pay for a NEFT fund transfer. UPI charges are as low as 50 paise. The first move to bring down costs of card-based transactions came in 2012, when the RBI capped the debit card MDR at 0.75 per cent for transactions up to `2,000 and 1 per cent for transactions above `2,000. The cap was further lowered in December 2016 during the peak of demonetisation. 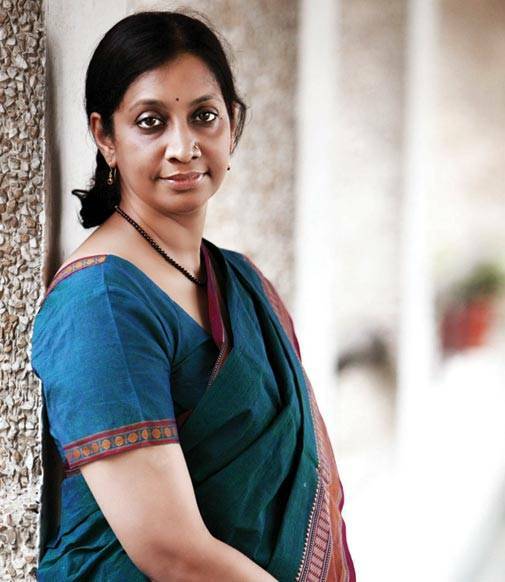 Aruna Sundararajan, Secretary, Ministry of Electronics and Information Technology, says, "The MDR has come down and is expected to fall further. It can also come down to zero in future." However, these developments may not yield the desired results. A Visa report on "Accelerating the Growth of Digital Payments in India", released in October 2016, says: "In September 2012, the RBI introduced a cap on MDR on debit card transactions. It was envisaged that this would expand infrastructure and increase debit card transactions and usage exponentially. This has not been the case, as the RBI has found." Another reason for the low popularity of card payments has been the high cost of point-of-sale, or PoS, terminals, which used to be anywhere between Rs 8,000 and Rs 15,000. According to the Visa report, countervailing duties and taxes accounted for 20 per cent of this. There is also an annual operational cost of Rs 3,000-4,000. But, of late, the cost of buying PoS machines as well as the cost of running them have been coming down due to government intervention and technological innovations. "With new technology-driven software-based PoS systems, the cost of PoS machines is now almost negligible, as the systems can be downloaded free of cost on smart phones," says Sundararajan. 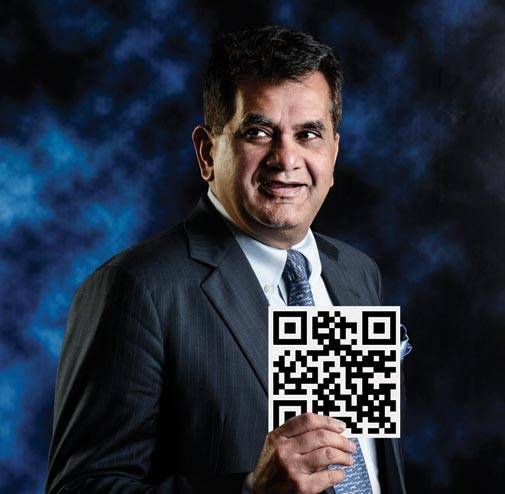 Amitabh Kant, CEO, NITI Aayog, who heads a government committee for pushing digital payments, also says that costs of micro-ATMs, bio-metric devices and PoS machines have reduced significantly due to Customs and excise duty waivers in the Budget this year. The government has removed all taxes - basic Customs duties, excise, countervailing duties and special additional duty - on miniaturised card readers, mPoS micro ATMs, finger-print readers, scanners and iris scanners. The traditional card-based payment systems will continue to have slightly higher costs. The big leap will come from new internet- and mobile phone-based solutions. While technological innovation is the key here, it is the government's readiness to adopt these technologies that will push down costs further. After demonetisation, it has done just that. Whether it is the development of Bharat QR, an interoperable Quick Response code acceptance solution, or launch of BHIM, a mobile app-based solution, the government has shown eagerness to adopt payment technologies that can trim costs to as low as possible. "Growth in digital transactions is coming at a time when new technologies are coming up. These are giving us an opportunity to work on internet- and mobile-based solutions. These will reduce costs. Our model is to work on a different technology framework in which the cost of transactions will be negligible," says Sundararajan. A transaction through the BHIM app, a UPI-based solution, costs as little as 50 paise. NPCI, which has developed the app, does not charge anything, though banks may charge a nominal fee. SBI, for example, does not charge any fee on transactions up to Rs 1,000 but deducts Rs 12 plus service tax on transactions up to Rs 2 lakh. "The earlier regime was based on low volumes and asset-heavy infrastructure. 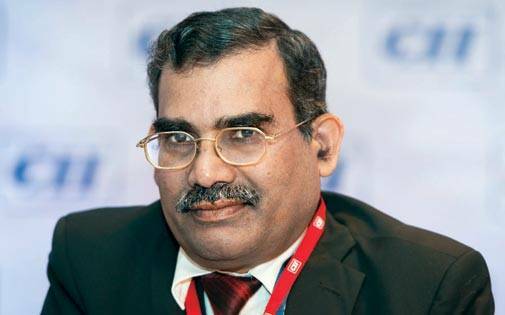 Now, as fundamentals have changed in a way that volumes have risen exponentially and zero-cost acceptance infrastructure (QR code) has developed, the cost has to change," says Kant of NITI Aayog. Kiran Vasireddy, Senior Vice President, paytm, says the introduction of payment methods such as Aadhaar pay, BHIM and UPI is a big step towards digital economy. "The government has undertaken several steps to incentivise digital payments. The reduction of debit card/UPI fees will bring down costs further," he says. The pricing, as in all areas, is a function of volume. Unless the government creates awareness about the benefits of digital payments as well incentivises such transactions, the fall in costs may not be substantial. A.P. Hota, MD and CEO, NPCI, says charges for services provided by NPCI have not fallen since their launch due to low digital payment volumes. There is scope for lowering costs when volumes go up, he says. According to a NITI Aayog report, in October 2016, the number of digital payments was 900 million, which meant just one transaction per adult per month for approximately 900 million adults. The government is targeting 30 billion payments a month by December 2017. The government has also been trying to bring more people into the digital payment net through cash rewards and tax incentives. For instance, it launched DigiDhan, where 16 lakh lucky winners (users and merchants) were given prizes ranging from Rs 1,000 to Rs 1 crore for making digital payments. It has also launched referral and cash-back schemes for BHIM users and reduced the presumptive tax rate for small traders and businesses from 8 per cent to 6 per cent on revenues received through digital and banking channels. Lower transaction costs will play a role in making digital payments popular, and even though prices have been coming down due to competition, innovation and market dynamics, government interventions may still hold the key to making digital payments affordable for millions of Indians with modest means.